“The only person who can remove the CJN in the Constitution is the President. The removal could take the form of presentation of the matter before the Senate by the President. “The Senate cannot bring the matter before themselves, nor can the National Judicial Council." An eminent professor of law, Itse Sagay (SAN), yesterday said President Muhammadu Buhari only obeyed a court order in suspending Chief Justice Walter Onnoghen. He said the President’s action was in line with the rule of law as there was a valid order, which he obeyed. Sagay told The Nation last night that Chief Justice Onnoghen’s removal was also morally justified as he had admitted that he did not fully comply with the assets declaration requirements. He agreed that the Constitution empowers the President to remove the CJN through the Senate. 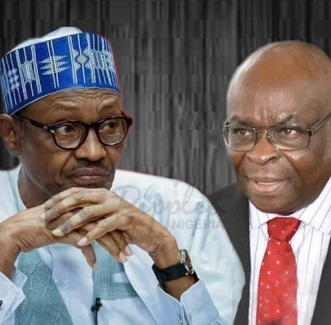 However, he argued that the president could also suspend the CJN pending when the Senate votes on whether the CJN should be removed or not, According to him, the CJN could return to his post if the Senate does not remove him by a two-thirds majority. Sagay said: “The suspension is morally justified and legally justified. Morally, he should not be in that office considering what has happened. Legally, the President has powers to remove him. “The Code of Conduct Tribunal gave an order that the CJN should be removed from office. So, the President carried out a court order. “If anyone says it’s an exparte application, my answer is that all the orders they got from courts over the matter were ex-parte. “So, the President was obeying a court order and for the rule of law to prevail, he should obey court orders. That’s number one. “Two, without even going to court, Section 292 (1) of the Constitution provides for the CJN’s removal, including over a breach of the Code of Conduct. He has committed a breach of the Code of Conduct and he has admitted it. “The only person who can remove the CJN in the Constitution is the President. The removal could take the form of presentation of the matter before the Senate by the President. “The Senate cannot bring the matter before themselves, nor can the National Judicial Council. “He can then take his name to the Senate for consideration for permanent removal. If the case fails and the Senate cannot vote by two-thirds majority, then the CJN returns to his post.